The Shishou Yangtze River Highway Bridge, the 27th bridge across Yangtze River in Central China’s Hubei Province, successfully closured on April 9, 2019. The project, with a total length of 39.723 kilometers, ranges from west Puji Town of Jiangling County to west Gaojimiao Town of Shishou City, with an estimated investment of 7.52 billion yuan. 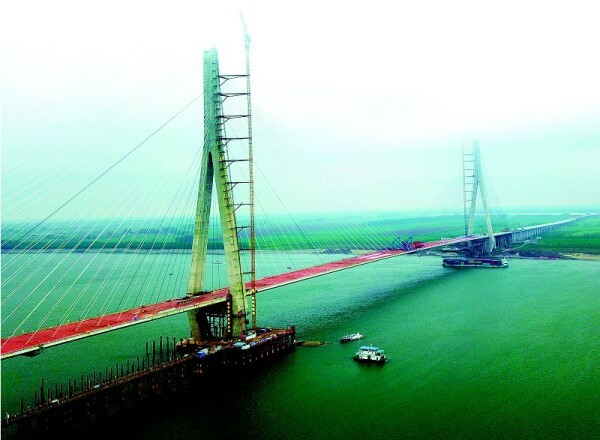 The five bridges, including Shishou Yangtze River Highway Bridge, Xiangxi Yangtze River Bridge, Gong’an Highway-Railway Combined Bridge, Jiayu Yangtze River Bridge and Yangsigang Yangtze River Bridge, are scheduled to open to traffic within 2019, witnessing 31 Yangtze River bridges completed in Hubei.